Hewlett-Packard announced its "most compact" multifunction laser printer, which prints documents from smartphones and tablets, the company said Tuesday. The HP LaserJet Pro 100 MFP M175NW multifunction color printer is priced at $349 and aimed at personal use and small and medium-size businesses, the company said in a statement. Users will be able to remotely print documents from select mobile devices through HP’s mobile printing service called ePrint. With ePrint, users can securely print documents from compatible printers that are nearby or at remote locations such as hotels, airports or libraries. HP has already enabled ePrint capabilities on mobile devices like its Palm or Research In Motion’s BlackBerry smartphones. iPhone and iPad users can also wirelessly print documents directly on HP’s ePrint printers via the AirPrint feature in Apple’s iOS. 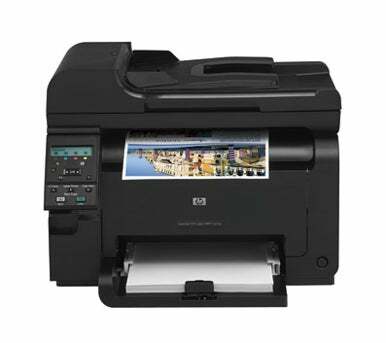 Documents can also be printed on compatible HP printers from Google’s cloud-based Gmail and Google Docs applications with ePrint extensions. An e-mail address of an HP ePrint-enabled printer needs be added to a unique Google account tied to a smartphone or tablet. Multiple printers can be tied to one Google account and users will be able to select the printer. The printer can print up to four color pages and 16 black-and-white pages per minute, according to product specifications on the company’s website. The scanner can capture images at 1200 dots per inch (dpi) resolution. The printer has USB 2.0 and Ethernet ports and Wi-Fi capabilities. The company did not immediately return requests for comment on worldwide availability. The printer is listed for availability on a few retail sites such as OfficeMax.